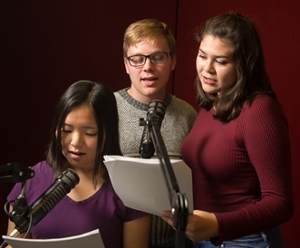 “Academia Underground,” an original soap opera drama, is performed, directed, produced and written by SIUE students and staff. The first episode is expected to air at 10 p.m. Wednesday, Nov. 8. The idea of the student-involved project had been, for several years, on each of the minds of Peter Cocuzza, professor in the Department of Theater and Dance, and Steve Jankowski, WSIE director. “I was talking to Steve one day, and he said he had this idea for a radio soap opera drama,” said Cocuzza, who wrote the script. “I told him that I had been thinking about such a project for several years.” Cocuzza began writing the drama in September 2016. Students from the Department of Theater and Dance will help with the performance of the drama. Students from the Department of Music will work on the sound track, instrumentation and other sounds, while Mass Communications students will help produce the show, according to Jankowski. To date, there are 12 students involved. The first season will consist of eight, 30-minute episodes, scheduled to run Wednesdays from Nov. 8-Dec. 27. During the first season, the main four characters, all freshmen, will tackle issues such as drinking, plagiarism and character development. A lot of work has gone into writing, rehearsing and producing “Academia Underground,” according to the assistant director, Hannah Warntjes, a junior majoring in theater performance. “Academia Underground” is also expected to be performed in front of live audiences, according Cocuzza and Jankowski. Rehearsing lines from “Academia Underground” are (L-R): freshmen Jenna Heng, Thomas Harrison and Elizabeth Hernandez. 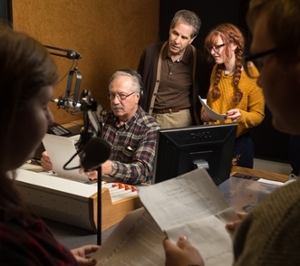 Producing the radio soap opera drama in the studios of WSIE is the SIUE Theater of the Mind Production Company, which includes WSIE Director Steve Jankowski (seated), Department of Theater and Dance Professor Peter Cocuzza (back left) and freshman Clara Parker (back right).